The original K900 was designed to do one thing: prove Kia can build a luxury car. Now completely redesigned for the first time ever and released as a 2019 model, the second-generation K900 is moving its goalposts. It seems to be aiming not just for luxury, but world-class luxury. It also has made an impossible-to-miss shift to sportiness that’s a stark turnaround from the outgoing K900, a spacious, soft-riding boulevard cruiser. Built alongside Kia’s spectacular Stinger sports sedan in Sohari, South Korea, the new K900 shares a distinctly BMW-like driving feel. That’s no surprise considering a longtime BMW alumnus and former head of the M performance division, Albert Biermann, led the development of its handling. It shows an attention to detail and feeling of solidity over the road that’s rare outside pricey German competitors. Kia’s top-of-the-line luxury model gets an all-new design for 2019. Built on the same assembly line as the Stinger, the K900 also now shares its exciting-to-drive mission. And that raises the most interesting question about the K900: Will it sell? After moving nearly 4,000 units over its first two years of production, the first-gen K900’s U.S. sales dwindled from small to nearly imperceptible. Sales totaled just 354 last year, not enough to keep it viable as a mass-market product. German luxury buyers are, if you believe the stereotypes, decidedly brand-conscious. Part of their appeal is the badge on the hood, so it’s interesting that Kia — which also sells the Rio starting a hair over $15,000 — would aim the $59,900 K900 squarely at the pricey Germans, which is what they’re doing. Will following BMW’s sporty-handling playbook turn that trend around? 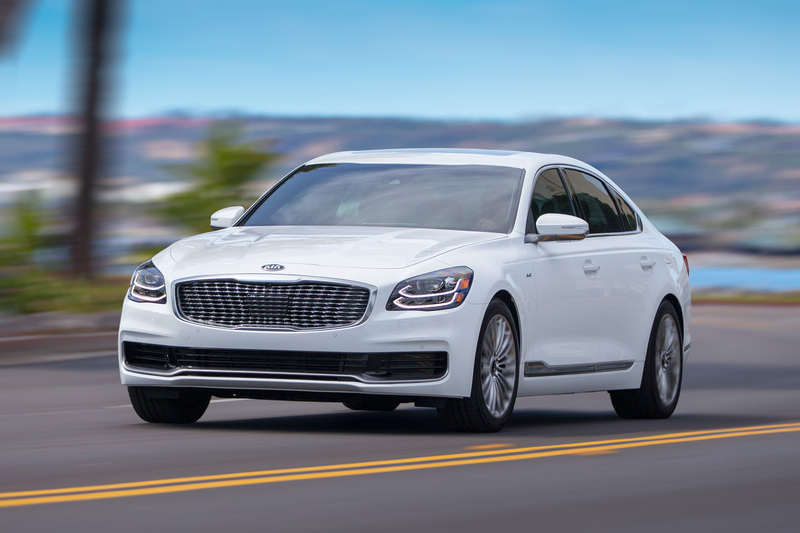 And will keeping the K900 and Stinger under the Kia banner, not spinning them off into a luxury division that can be marketed as such, work in America? There are more questions about this car than there are answers. Many American buyers would be surprised to learn Kia even sells a full-blown luxury car in the United States, still thinking of Kia as a bargain brand from decades past. Its cousin, Hyundai, has decided to spin off luxury models under a separate brand, called Genesis, which follows the well-trod path of Toyota spinning off Lexus, Honda spinning off Acura, et al. A week driving it has me convinced that this new K900, in everything but the badge, carries enough prestige to win over buyers from deeply established competitors. While its sparkling handling is its top selling point — brilliantly blending silence, poise, feedback from the road and excitement in corners — its stunningly designed cabin is a close second. 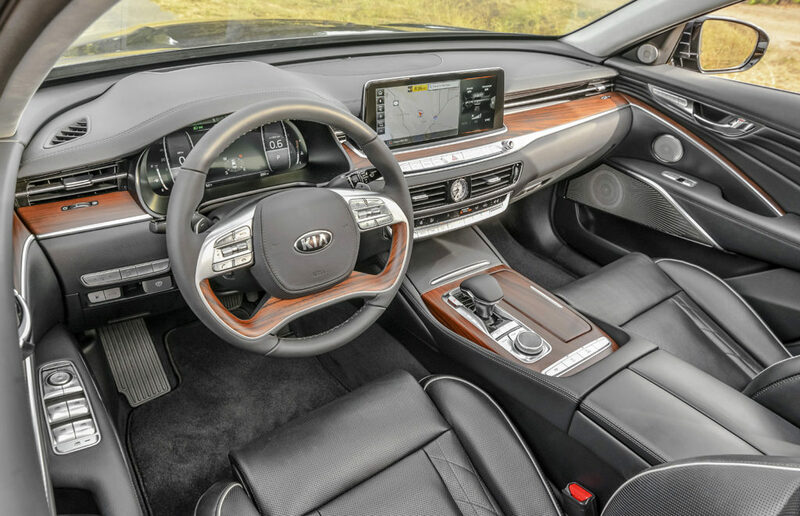 Crisp, clear, fast-responding digital screens behind the steering wheel and in the center of the dash run Kia’s UVO digital interface, one of the best in the automotive industry. Sitting in this car feels special. You’re surrounded by leather, open-pore wood, aluminum trim and well-thought-out technology, including a 12.3-inch touchscreen that runs one of the best infotainment interfaces for sale today. In terms of technology, I actually prefer the K900 to the last $100,000-plus Lexus I drove. It comes standard with a system that lets you start the car and set the cabin temperature remotely from a smartphone or computer, for example, and emphasizes speed and simplicity over flashy graphics and fussy touchpads. To me, good design is the ultimate indulgence. For people looking to avoid luxury-brand stereotypes, the K900 provides a fascinating mix. It’s the best Kia I’ve ever driven, by far, providing the same features and refinement as expensive German and Japanese competitors but without a whiff of their name-brand arrogance. This new-generation car has spectacular, BMW-like handling. It drives with the prestige and refinement of a German sports sedan, but at a bargain price and without the name-brand baggage.